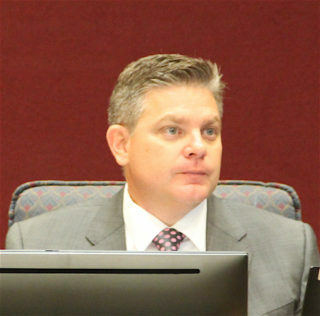 Sarasota County Administrator Jonathan Lewis cautioned the county commissioners in late May that extra public outreach they requested that day would delay implementation of new measures to spur the development of affordable housing. Nonetheless, this week, Commissioner Alan Maio expressed frustration that ordinances focused on “half dwelling units” comprising 750 square feet or less space, as well as reductions in county water and wastewater capacity fees for those smaller homes, still have not been implemented. “We need to get these ordinances that this board unanimously already approved codified quickly,” Maio pointed out. Additionally, Commissioner Charles Hines asked about action he also recalled the board seeking last year: creation of what was characterized as a “mixed-use zone” that would allow the construction of residential units in commercial centers with vacant “big box” stores, such as the Sears space at Sarasota Square Mall. As Hines pointed out during that March 1, 2017 discussion, big shopping centers already have the necessary parking spaces and stormwater facilities, so a developer would not have to worry about meeting any county requirements regarding those facets of a project. At the time, Maio suggested that individuals who had suggested the concept — including a former long-time county planner — start working with staff to explore making mixed-use zones part of the county Zoning Code. The Nov. 28 discussion began as the board was considering recommendations from members of a committee required by the state to review affordable housing regulations and suggest new incentive strategies. 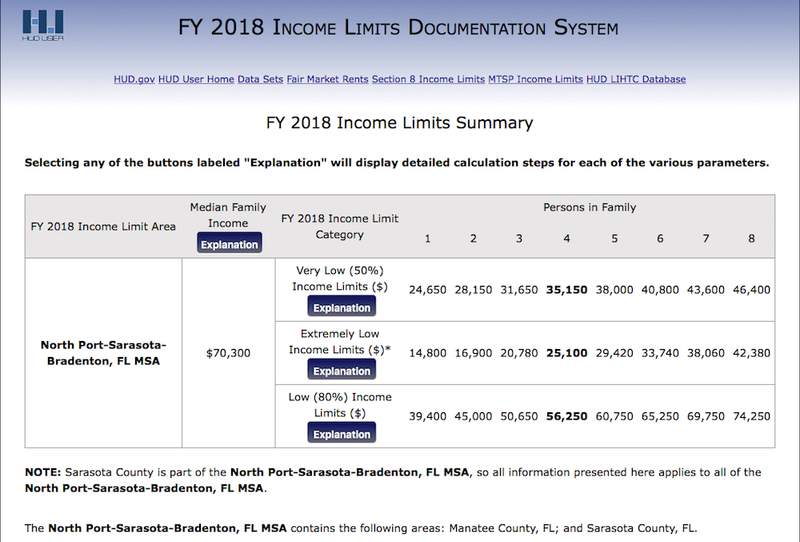 As Jane Grogg, manager of the county’s Planning Services Division, explained, such a committee must meet every three years under the guidelines of Florida Statute 420.9076. During the exchanges this week, Maio also talked of a scenario in which he and his wife could buy a fully leased, 1970s strip center, with the goal of adding a second floor to the storefronts; each residential unit would comprise about 1,000 square feet. He predicted that upon meeting with county staff to ask about such a project, “I think I’m going to immediately be told we don’t have the rules in place to do that.” Staff would probably say rezoning of the property would be necessary, he added. Moreover, even though most of the businesses would be closed after 5 p.m., Maio said, he expected staff would tell him not enough parking was available to conform to county regulations. In response to Maio’s comments, Zoning Administrator Donna Thompson explained that the Zoning Code does permit upper-story residential units in Commercial General districts. However, only 9 units per acre are allowed without the granting of a special exception, she said, which would enable a builder to construct up to 13 units per acre. Even the latter figure, she said, “probably is not the density that would be sought” by a developer, to make a project financially feasible. 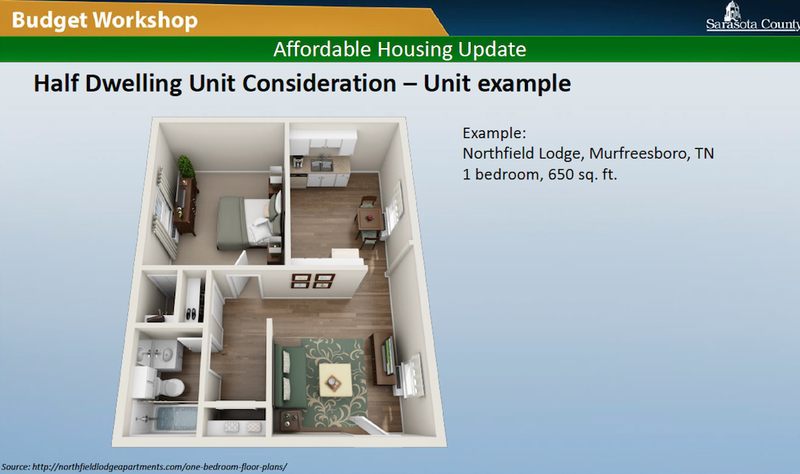 County Administrator Lewis said that he believed the last time staff updated its one-page affordable housing fact sheet was in June, so he would follow up on that. Additionally, Maio pointed out that the board members must push back against county residents who do not want affordable housing projects built near their neighborhoods. He has talked in the past of remarks indicating that developments of lower-priced homes would lead to neighbors’ falling property values. Chair Nancy Detert also voiced again her support for smaller housing units. In the past, she has talked of being a big fan of tiny houses. “What I see that we’re doing great is like what we did with the Pinecraft [Overlay] District,” she told Grogg. Earlier this year, the commission unanimously approved an ordinance that included provisions related to the typically smaller homes in the historic Pinecraft community, many of whose residents are Amish and Mennonites. Pinecraft is bordered mostly by Beneva Road and Bahia Vista Street, just east of the Sarasota city limits. “We’re allowing creativity,” Detert added. 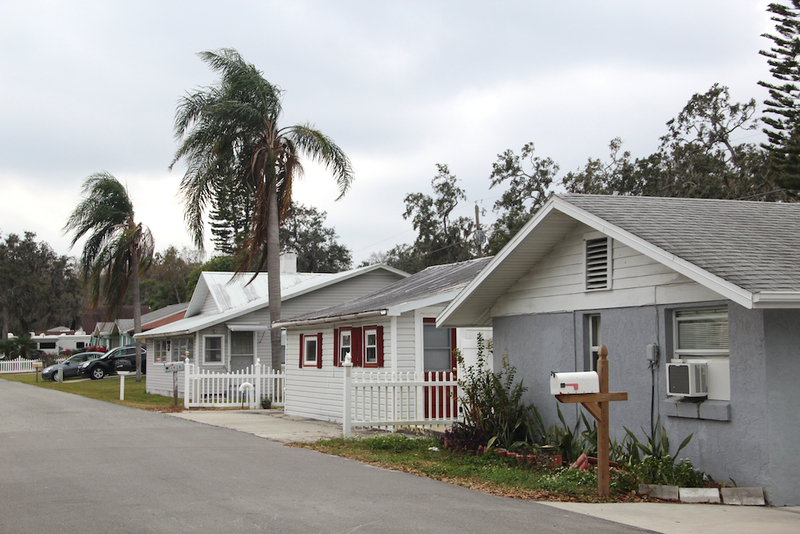 The state of Florida saw a significant increase in population decades ago through the establishment of multitudes of mobile home parks, Detert noted. Perhaps tiny home communities will prove to be a modern version of that housing, she said. 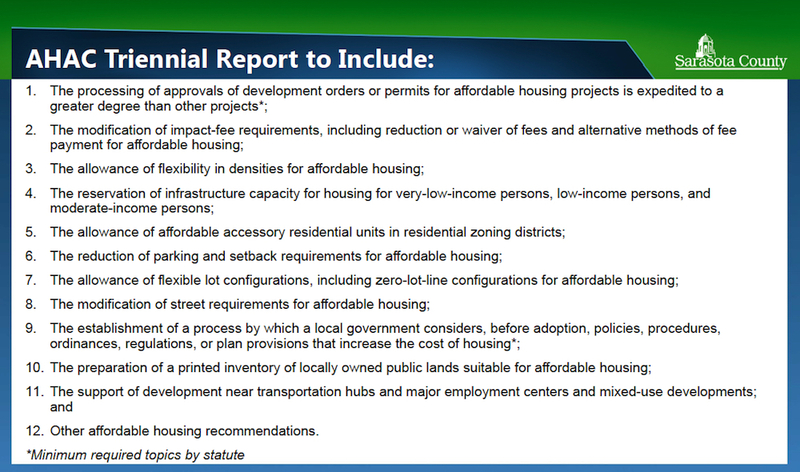 During her Nov. 28 presentation, Grogg of the Planning Services Division explained that the Affordable Housing Advisory Committee in the community had worked as directed by the governing state law. The members had reviewed established policies, procedures, ordinances, land development regulations and the county’s Comprehensive Plan. Every local government that receives State Housing Initiatives Partnership (SHIP) funds must appoint such a committee to recommend specific actions, she explained. The local group had been meeting over the past six months, she added. 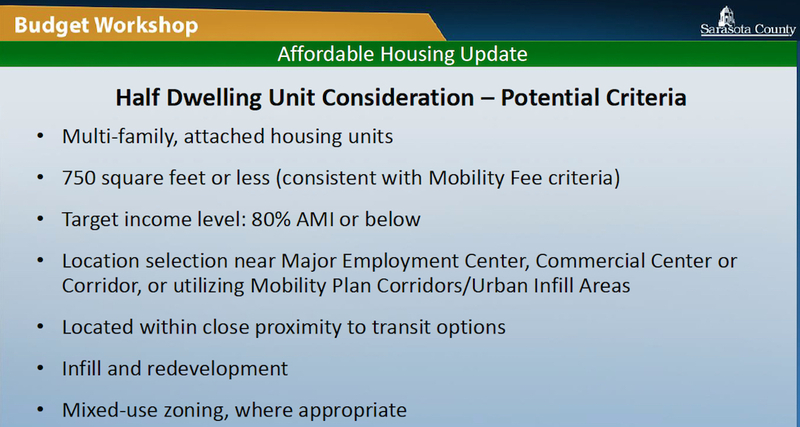 Among the committee’s recommendations, Grogg said, are to allow for increased density in affordable housing projects through the use of the half-dwelling unit option. Jon Mast, chair of the committee, told the commissioners he and the other members believe struggling commercial centers in the county would be perfect for affordable housing projects. However, he stressed that the commissioners must have “the political will” to refute the complaints of members of the public about extra density and traffic. “It’s going to be up to you,” he added, to make such projects possible. The committee suggested using a certain number of escheated lots for on-site development of affordable housing projects for households with a cap of 80% of the Area Median Income (AMI), Grogg said. Property where such development is not feasible, she added, should be sold, with proceeds going into an affordable housing trust fund. The money could be used to help pay mobility and impact fees, she indicated. 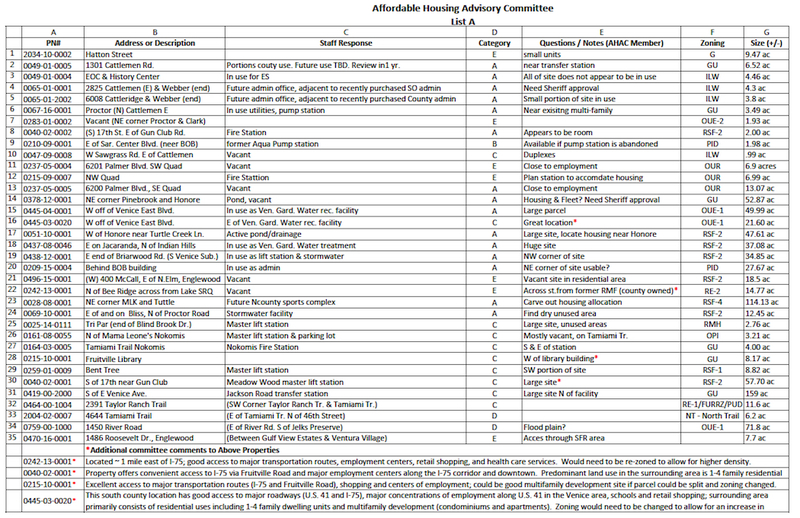 Additionally, the committee members identified 35 county-owned parcels, some of which have been designated as surplus, that could become affordable housing sites under public/private partnerships, she noted. The next review of the county’s mobility fees is due in 2021, with impact fees to be studied in 2022; such reviews take place every five years, Grogg noted. Thus, staff recommended that the reviews stay on the established cycles. At the conclusion of the hour-long discussion on Nov. 28, Commissioner Hines made the motion to accept the committee’s recommendations, and Commissioner Maio seconded it. The motion passed 5-0.